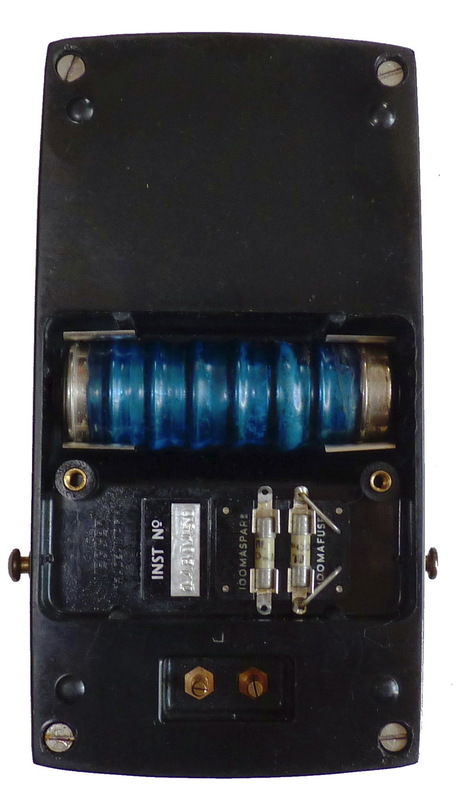 Evershed and Vignoles Battery "MEGGER" Tester in black plastic case. In need of attention. Date perhaps 1962/3. Evershed and Vignoles ltd, Acton lane, Chiswick, London W4 UK. I made an offer for this 'battery Megger tester’ (catalogue 4003) on eBay in 2017 and have had a look at it. 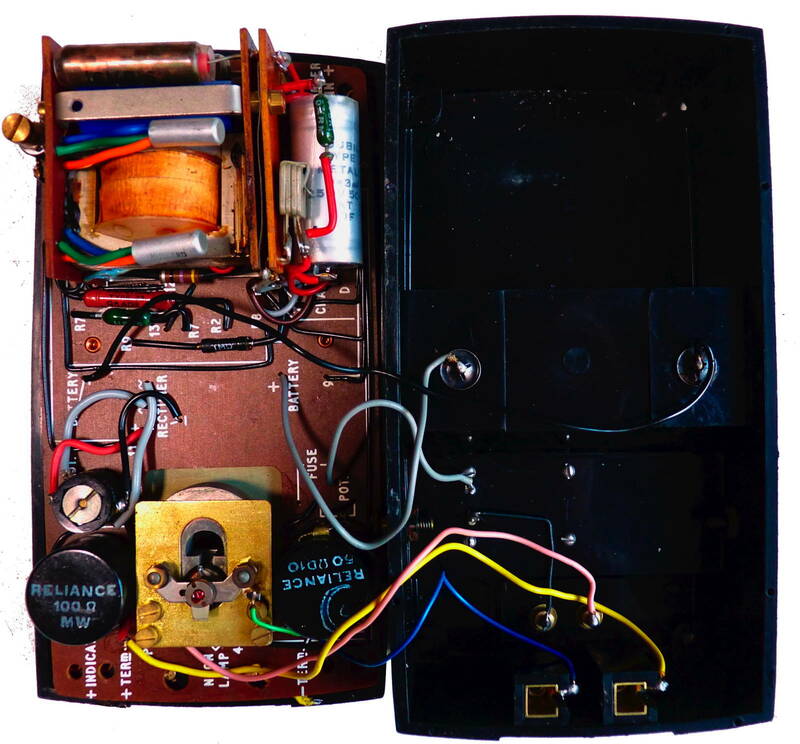 As expected the battery is long past its best but the meter movement works and the transistor circuitry functions to produce a test voltage. But the meter reads about 5% low and it was not possible to set the megohm or the ohms ranges. I discovered that the meter needed more than 1mA for full scale deflection and that the max voltage generated was 410 volts. It came complete with leather case, test leads, strap and cardboard box containing an instruction leaflet BMT516 and another No.382 outlining other products available at the time. Mike Niven kindly sent me a copy of an instruction data folder for this range of instruments the 4003, 4004, 4007 and 4008 but sadly no circuit diagram but the information did help me understand how the instrument was intended to work. It seems the 4007 and 4008 are later versions of the 4003 and 4004 instruments including an additional fuse and some circuit modifications but the documentation does not indicate the difference between the 4003 and 4004. This was not the easiest meter to service but in the end I found that after cleaning the switch and push button contacts the continuity tester could be set and after replacing one of the AC83 transistors which came apart when I pulled on its leads to find that the base connection had never been properly soldered. I used an AC81 which is all I had at the time. 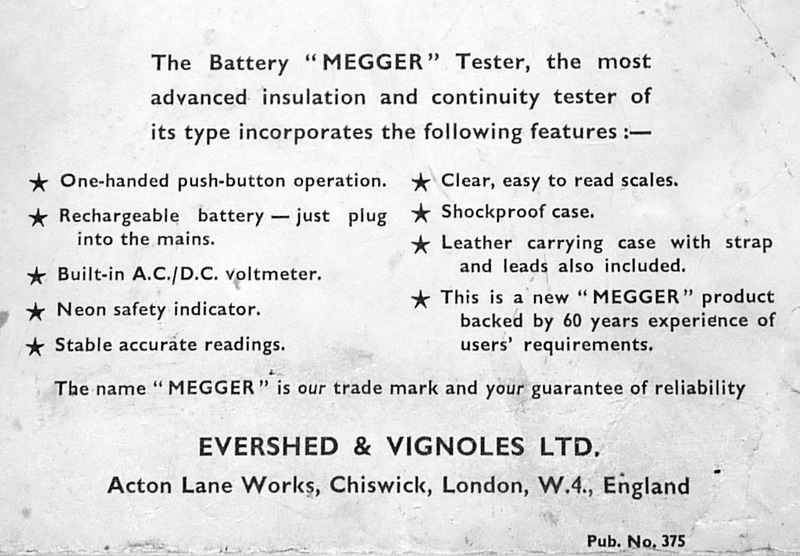 In 1962 Evershed and Vignoles embarked upon a completely new approach to the further development of their instruments employing the advantages of transistor technology permitting the use of realistically low supply voltage requirements which could be supplied with batteries. 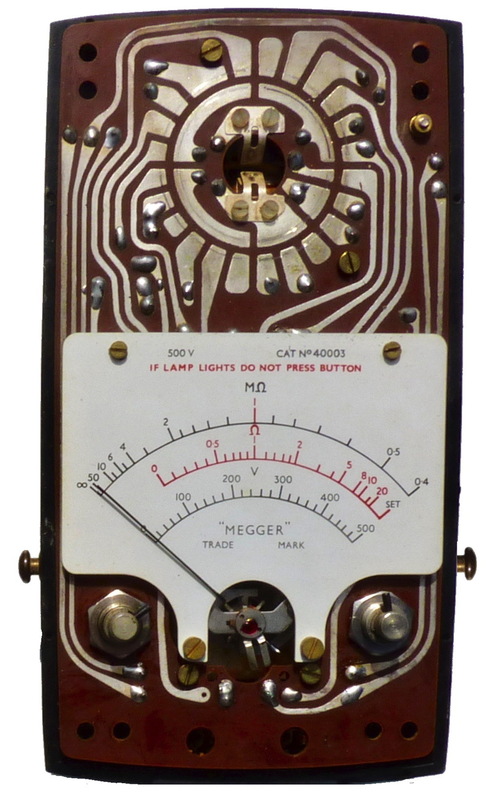 This instrument was the first Evershed and Vignoles megger/continuity tester that did not incorporate the cross coil meter movement that had been used in all their previous ones. Great claims were made for it, though I expect Sydney Evershed would have turned in his grave with the rejection of his favoured method of measuring resistance. It seems that it was not very popular as very few still seem to exist. The later BM6 and BM7 instruments worked on the same principle. 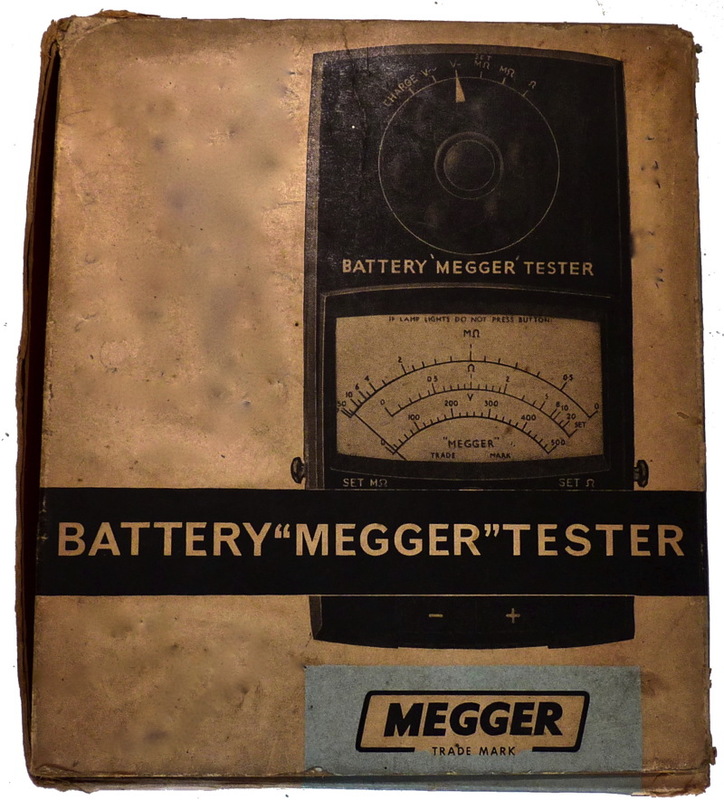 The test voltage of the Battery "MEGGER" Tester is generated by a battery driven DC converter. It also utilises a milliammeter type of movement for the actual resistance measurements in place of the cross coil movement which one has come to associate with "MEGGER" Testers. By replacing the more usual hand driven generator with a transistorised (two AC83 germanium transistors) test voltage source, one hand push button operation has been achieved. Moreover, the use of a milliammeter movement has made possible the inclusion of both a.c. and d.c.voltage measuring facilities covering the ranges most useful to the electrician. The power requirements are provided by a rechargeable battery of 7 hermetically sealed high capacity nickel cadmium cells (225mAH) which is accessible from the base of the instrument so that the instrument is not dependent on the availability of a suitable battery. A mains operated charging circuit is included in the instrument which will recharge the battery when the instrument is not in use. The charging circuit consists of a surge limiting resistor, series connected with a capacitor (which determines the charging rate), and small bridge rectifier. By utilising a capacitor as the voltage dropping component, power losses and consequent heating are significantly reduced and, additionally, the circuit inherently ensures that the charging voltage will always be in excess of the battery voltage. 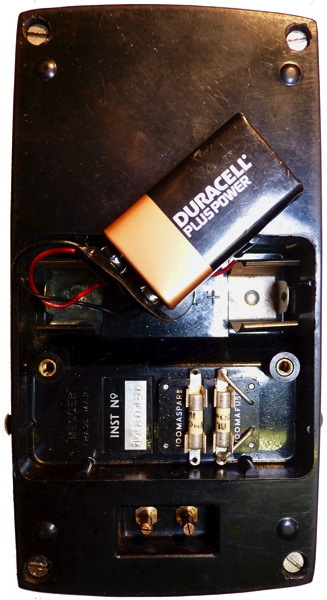 The charging circuit which is protected by a fuse and is suitable without alteration, for connection 250 Volt or 110 Volt mains. 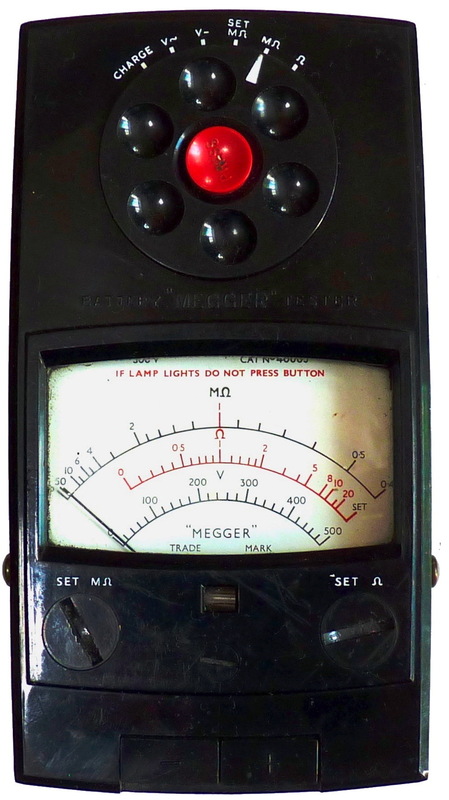 In common with the hand operated Series 3 tester the Battery"MEGGER" Tester includes a continuity range. For DC voltage measurement, the meter movement is series connected with a high stability resistor and for AC voltage measurements a bridge rectifier is brought into operation. The mechanical construction of the instrument centres around a main platform which contains most of the wiring in the form of a printed circuit, and which carries the movement and the scale. The range switch forms an integral part of the printed circuit but serves for the selection of the required circuit only. Actual operation requires depression of the "test"button arranged concentrically with the range switch. This knob embodies a locking device to facilitate series of tests or tests of long duration and enables the instrument to be used without hands. The “set megohm" and "set ohm"potentiometers are adjusted by means of grooved knobs flush mounted with the top of the instrument.